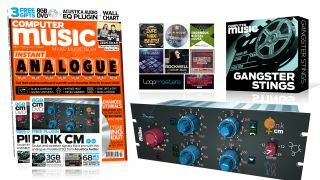 This month we're going back in time to fill our digital DAW-based tracks with the nostalgic sound of analogue gear and production techniques… but that's just the start of this huge issue - we're also giving away a free analogue-modelled EQ plugin from Acustica Audio, pepping up your productions with 20 'studio workout' tips, catching up with the hottest pro producers, and giving away 3GB of samples! Pay less by choosing one of our print or digital subscriptions, and get your free copy of the AIR Xpand!2 workstation instrument - worth £80 - when you subscribe or resubscribe to CM via our link. Read more about the offer, or dive right in and grab your subscription now! What is it about those classic tracks from the pre-digital days? How did the combination of circuitry, tape and hardware create the sounds everyone strives for today? And how can we get that atmosphere back using modern music software? We've got the answers to all those questions across 19 pages and 9 videos this month. Feast your eyes on the whole lot with your copy of CM239, and check out the video below to get a taste of what's in store in this massive feature. Fitting in perfectly with our analogue-themed issue is this high-class EQ unit from the Italian hardware-modelling tycoons. Readers of this issue get their own copy of Pink CM to grace their tracks with its top-drawer filters. You can check out the sound of this awesome VST/AU plugin in the below video, read the full spec here, and grab it for yourself with your copy of CM239! As the year draws to a close, it's completely normal for your tracks to get a little bit flabby, your mixdowns to lose energy, and for your studio to get a little out of control. So make a resolution this year to get your productions back in shape with the help of our New Year Studio Workout feature. We've got 20 tips and techniques to help you troubleshoot your tracks and start your musical year with a bang. We'll expose up-to-the-minute tricks and advice for a fresh 2017, including ten videos - start some light lifting with the one below, and get the rest only with issue 239 of Computer Music. Multiband processing can be a silver bullet for mixing, sound design and mastering applications, but it's a tricky art to get right. In this feature, we'll clue you in on what's so good about multiband processing, when to use it for best results, and we'll give you the lowdown on the best multiband processors out there. So whether you're looking to get control with multiband compression, get creative with multiband distortion, or even create your own custom processing matrix, we've got the answers you need. At CM, we're happy to travel the world in search of the best producer videos, and when we learned that overnight sensation Jacky Maughan was living the DJ dream in Ibiza, how couldn't we book ourselves a ticket? In this exclusive in-studio video, Jacky gives us a peek into his production techniques, deconstructing his track Apacheand dispensing some invaluable production wisdom along the way. We're giving away the first half of the video below, and you can get the rest with your copy of CM239! This month we're providing hundreds of free WAV loops and one-shots to put new life into your tracks. With our specially commissioned Gangster Stings pack, 503 film noir-style sounds to drop in or process to your heart's content. Next, we've got a bonus pack of Loopmasters samples, choice cuts from recent commercial releases that'll put the modern vibes right into any project. And to cap things off, our Songwriter's Toolkit pack sees 1200 guitar, drums, piano and keys samples brought down from the CM attic. Pay less by choosing one of our print or digital subscriptions, and get your free copy of the AIR Xpand!2 workstation instrument when you subscribe or resubscribe to CM via our link. Read more about the offer, or dive right in and grab your subscription now!